For some of us Winter is not that far away, so this cosy mug warmer will come in very handy for keeping your hot drinks lovely and warm, because after all there is nothing worse than cold tea or coffee, it can be crocheted in around an hour, so brighten up your mug tree by making a set and covering all your mugs. Use two colors or just one, whatever you decide I hope you Enjoy! 7th to 9th Round – Working through both loops of stitch from now on, ch1 1sc in base of ch1, 1sc in each sc to end, sl st to first sc on beginning of row. Fasten off at the end of 9th Round. Turn. 11th Round – ch3, * bpdc around next dc, 1dc in next dc, * rpt from * to * to last dc and ch3 to turn with, bpdc around dc, 1dc in top of ch3. Turn. 12th Round – ch3, * fpdc around next dc, 1dc in next dc, * rpt from * to * to last dc and ch3 to turn with, fpdc around dc, 1dc in top of ch3. Turn. Rpt 11th Round once. Fasten off. Turn. 14th Round – Join in color 1, ch1, 1sc in base of ch1, 1sc in each dc to end. Turn. 15th & 16th Round – ch1, 1sc in base of ch1, 1sc in each sc to end. Turn. 17th Round – ch1 1sc in base of ch1, 1sc in each sc to last sc, 3sc in sc, working down first side of split for mug handle, work 12sc evenly in row ends, 1sc in sc, 12sc evenly in row ends up second side of split for mug handle, 1sc in corner, sl st to next sc, ch10, (button loop) sl st in same corner. Fasten off. Finishing – Weave in all loose ends of cotton, sew on a button to correspond with button loop. 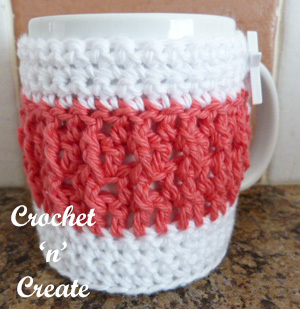 Hope you enjoy this free crochet pattern for the cosy mug warmer, make sure you pin it. The written instructions and pictures for this free cosy mug warmer pattern are copyrighted to crochet ‘n’ create © 2017. 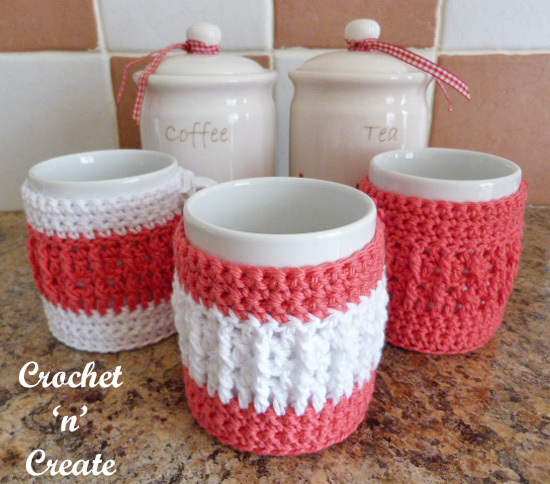 You are welcome to sell the finished products made from the free crochet cosy mug warmer pattern, I just ask that you please use your own pictures and put a link back to crochet ‘n’ create. If you wish to share this crochet cosy mug warmer pattern on social media or your blog please only use a direct link to the pattern page on crochet ‘n’ create. 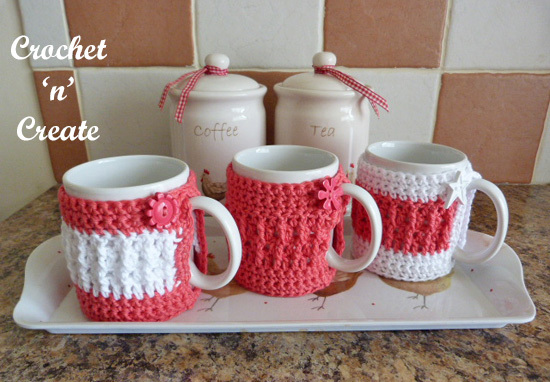 This entry was posted in crochet for the home, crochet for the kitchen, crochet mug cosies, free crochet patterns and tagged crochet, crochet for home, crochet mug cozy, free crochet patterns on 22nd September 2017 by crochetncreate.